Posted May 8, 2017 by Studio Assistant & filed under Member Interviews, News. 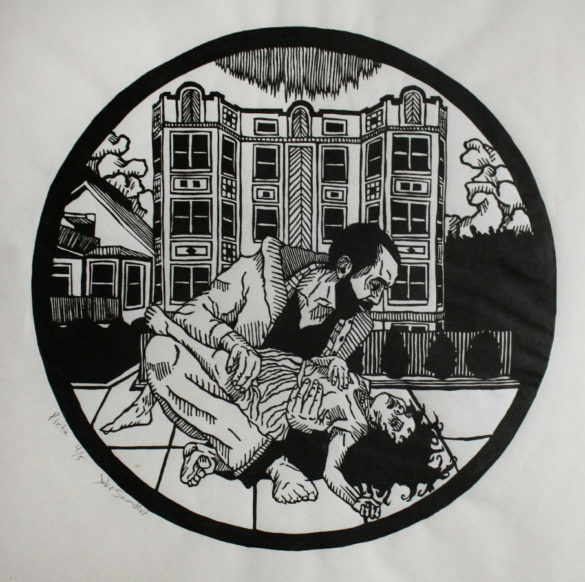 Matt Davis is a printmaker and occasional cartoonist, illustrator, and designer. He rents one of the six private studio at Spudnik Press, where he runs a small but vibrant risograph print shop called Perfectly Acceptable. He graduated from Oberlin College with a BA in Russian Language. How did you get started in risography? I got started in risograph printing when I was in college. I ran a student group, the Oberlin Comics Collective, that published a semesterly anthology of student work. 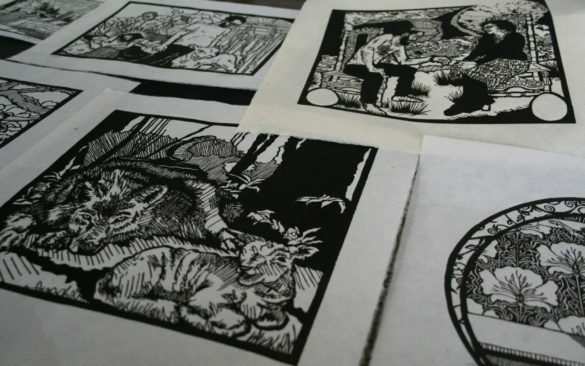 For our first few publications, we printed with the school’s print shop – and were often disappointed with the results. 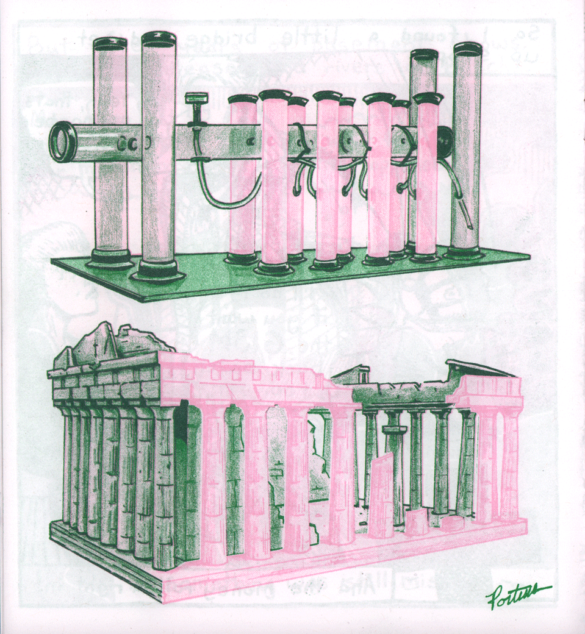 We were aware of risographs as they were starting to become popular with alternative cartoonists, who were using them to print their comic books and minis. To our luck, we noticed one sitting in the back corner of the local UPS store, and were able to buy it for a low, low price. 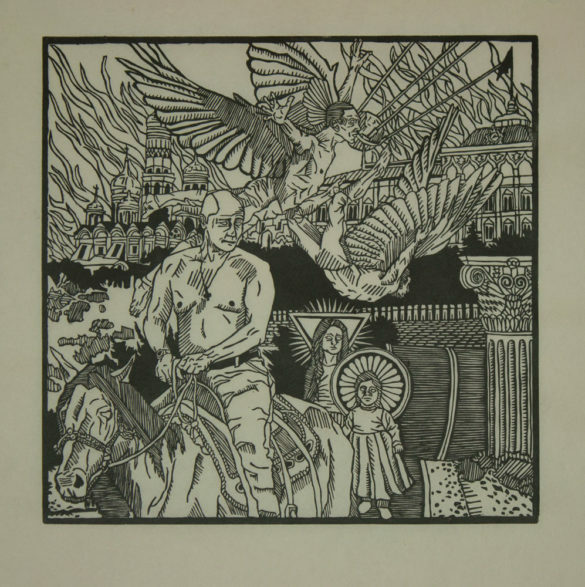 I totally fell in love with it (I wasn’t an art student) and suddenly I had unfettered access to a cheap and immediately gratifying means of printing anything I wanted to. What led you to establishing Perfectly Acceptable Press? It’s hard to say exactly when or what led me to establish Perfectly Acceptable. When I moved to Chicago I bought a risograph pretty much immediately, as it was a staple of my art practice in college. Word soon got out and I started getting emails from people asking if I would be able to print their projects. Though I don’t think I intended to become a regular commission printer, at the time I definitely needed the money. Business became more and more regular, so I thought I’d put a name to my services–Perfectly Acceptable. What does Perfectly Acceptable Press do? I continued doing commission printing from then on. Later, to keep myself occupied and “have fun” I started publishing books as well. So, rather than printing a book for someone for cash, I would work with an artist to develop a book, acting as an editor and designer, and then we would print it, and both sell the finished edition. This remains the two main branches of Perfectly Acceptable to date. We (royal we) also co-host a reading series called Zine Not Dead with our friends (royal friends) at Bred Press, Brad Rohloff. What is your favorite kind of work to make (art prints, comics, wedding invites, etc.) and why? I’ve found that the clients for comic printing jobs are usually the most fun to work with, and that makes the whole experience better. I love comics, so I can really connect with the finished product. 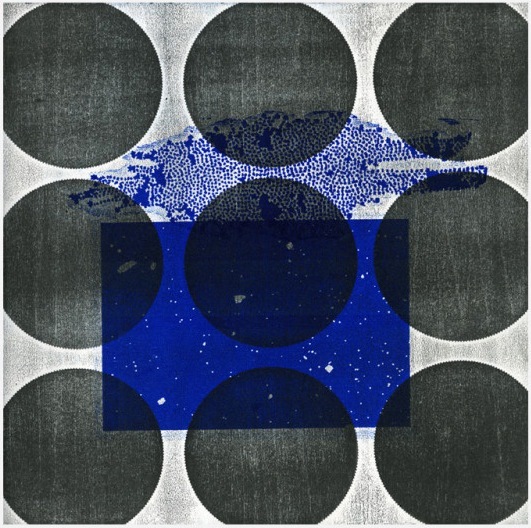 Who are your current artistic influences? 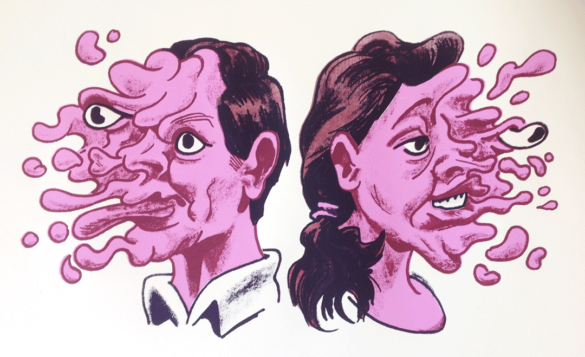 My friends and people I know who also print with risograph always impress me. To name a few big influences: my friend George Weitor of Issue Press in Grand Rapids, Michigan. Colour Code Printing in Toronto, Canada. Knust Press in the Netherlands. 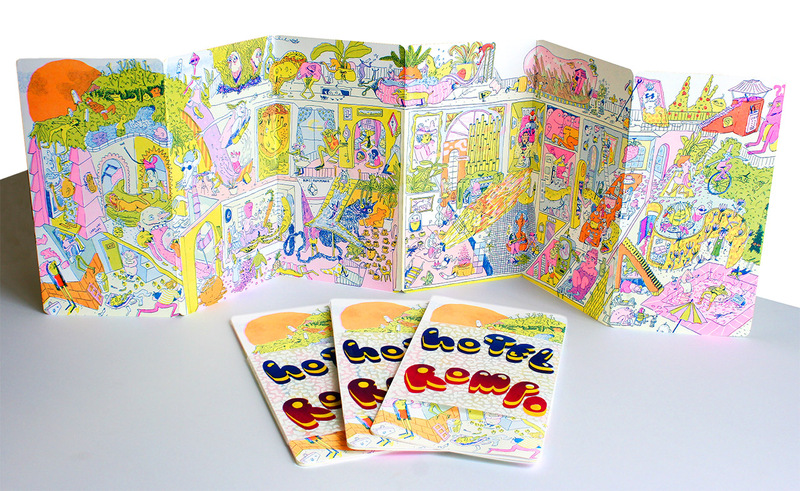 A lot of the artistic use of Risograph printing started in the Netherlands. What cartoon character do you most identify with, and why? I don’t think I identify with any cartoon characters… I read a lot of Calvin and Hobbes growing up, and I guess I related to Calvin since I’m an only child. What advice would you give to a new artist who is interested in learning more about risography? 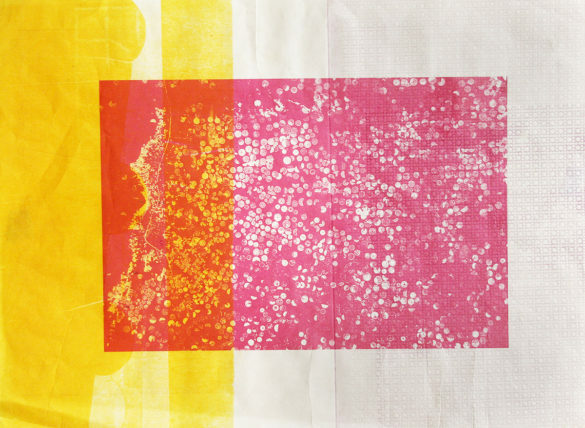 You just have to find a risograph, get your hands on it, and play around with it! Risography is still pretty new as an art form, so the community is super unpretentious and approachable. It makes it easy to jump right in. How often do you create work for yourself (not something for a client at Perfectly Acceptable)? I don’t do a lot of personal projects any more, since I’m printing for clients so much. I have found that the design element of publishing projects is more enjoyable than it used to be. Do you have any warm-up activities or rituals? Not really. I try to go in relaxed and with low expectations. The riso machine can sense fear, and it’ll mess up more if it knows you’re putting a lot of pressure on it. 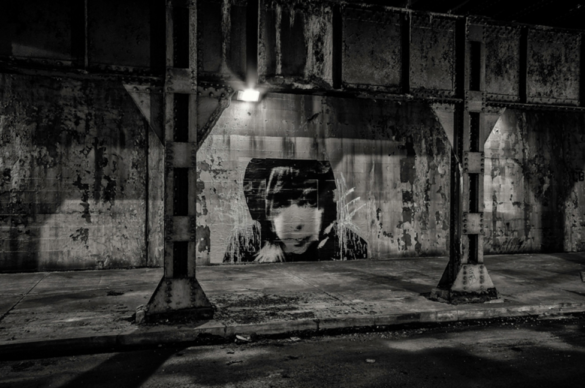 What is your favorite neighborhood in Chicago? It changes as I discover more, but I recently moved to Bridgeport and I love the quiet and self-contained vibe there. It feels like a summer camp! What do you do in your free time or when you need a break from creating? I don’t really ever take breaks, to be honest. But I really like hiking, so whatever hiking I can do in Chicago. I like to find paths through parks to walk around. 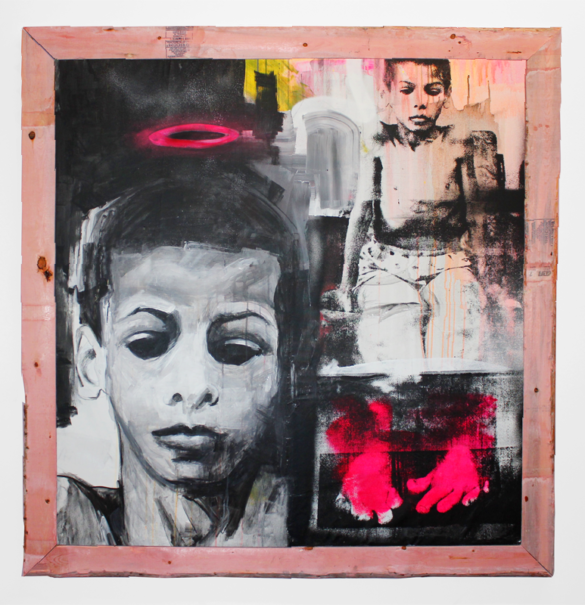 To see more of Matt Davis’ work, follow him on instagram at @PerfectlyAcceptable , or visit his website! Posted December 6, 2016 by Angee & filed under Member Interviews, News. On Election Day 2016, I sprinted up to the Press to meet with Spudnik Press member and cartoonist George Porteus. I had the opportunity to meet George when he was a guest artist at School of the Art Institute of Chicago, in Kaylee Wyatt’s class. George greeted me with a large smile and his long bouncy hair, saying he was more than happy to be here at Spudnik to be interviewed. Wearing his, as he calls it, “iconic Grimace purple jacket”, George also kindly complimented the modest comic I gave him upon our last meeting. 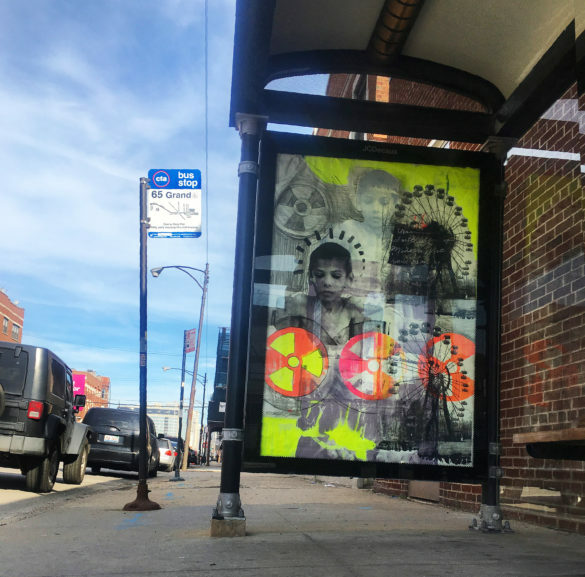 Former Maryland resident and MICA graduate, 32 year old George Porteus packed up his drawing supplies and moved to Chicago, Illinois four years ago. Upon sitting down in Spudnik’s Annex, he brought up how crazy it was that four years prior he was voting in the 2012 election. 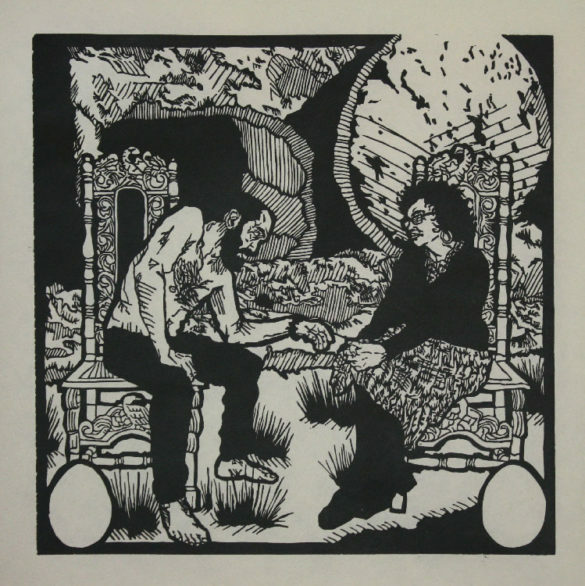 Although George was a practicing printmaker and cartoonist before moving, he attributes a lot of his success to the opportunity-filled midwestern city in which he now lives. 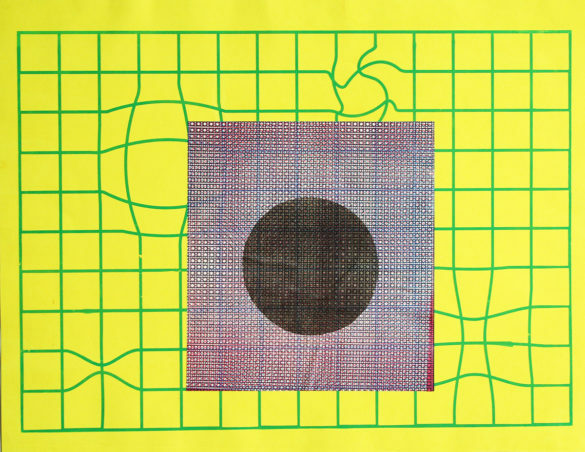 Despite the fact he has had a rough few past months trying to get to the press to print, George has in the past year debuted Enter to Exit at CAKE 2016 and is currently involved with many collectives within the city such as Zine Not Dead and Trubble Club. With an understanding of how financially, being an artist is always taking a risk, especially within publishing, George has a undeniable passion for making. 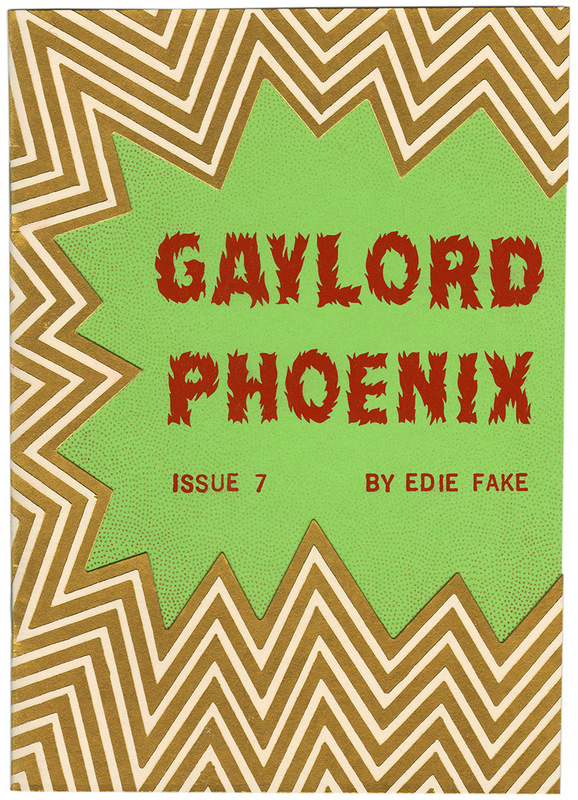 Comics and self-publishing became his calling upon moving to Chicago. He credits Brain Frame performative comix reading for allowing him to be involved and truly understand how close knit we all are in Chicago. Porteus: Brain Frame [was] place full of people where I felt where I belonged a little more than the outside world. My practice has been good ever since. It sorta oriented me in the right direction. Before that, artistically, I was um, I’ll say, unfocused with my efforts. I was drawing a lot but for no particular reason. So comics provided a really great context that requires very little, you know, prerequisite. Porteus: You don’t really need a degree. You don’t need anything more than a pen and paper and soon you wont even need that. Just an iPad pro or something like that. Howell: What kinds of things are influencing your current body of work? Porteus: Well, since starting to do comics in earnest maybe four years ago, I had a very fixed idea of narrative things I wanted to explore with comics. I have been honoring that, getting a little more ambitious each year with the lengths of the stories and how complicated or involved they are. And also the dialogue; the first few one-page narrative pieces I did for Lumpen [Magazine] were more or less one-sided so it was like a monologue, or silent, devoid of dialogue. [I have been] trying to improve my story telling abilities with a representational straightforward comic style. [This style of comics] interested me before starting to make comics myself. [Comics] where the story, um, does not alienate people. Like I think about the Simpsons. It’s a high bar to reach! Its funny, it goes down easy, but there is typically something a little more to it than that! The ability to appeal to a general audience and not alienate them, while still being subversive is kind of the magic trick. That is a though that I have had for a long time, since high school. Parallel to that is the practice I have observed within the comics community in Chicago. 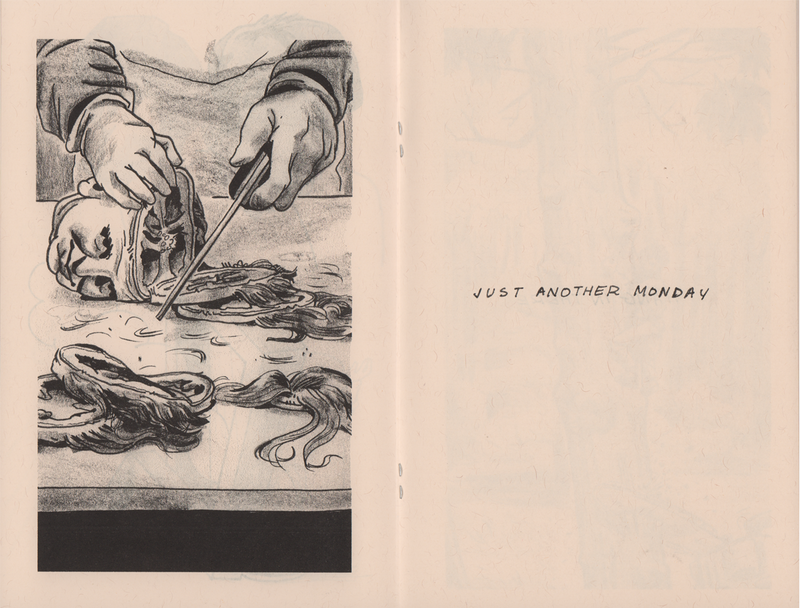 Comics work that [is trying] to bend everything I have just talked about as far as narrative art. Howell: Your work speaks on behalf of a more highbrow art form in my opinion. You use beautiful techniques you don’t see often in comics now a day. Porteus: Actually it’s interesting because, you’re right, you don’t see that these days so often, but the technique I use I completely ripped off from Her Block and political newspaper cartoonist predating World War II. Bill Mauldin who was a cartoonist for Stars and Stripes; you look back and it was all ink and crayon, which is all I use. It echoes the lithographic feel, which is something I was always into. It clicked to start using a crayon because I could better refine pieces but it’s still very much from the cartooning well. I was very excited. It opened up a lot to me. Prior to that I was a compulsive cross-hatcher, and it just took up too much time. I was going to get arthritis very soon. It didn’t excite people or myself. It was very easy to ruin a drawing by cross-hatching. The fact that it took twice the time to ruin a drawing by cross-hatching made it a easy decision [to use a crayon]. Howell: I’m aware you a member of Trubble Club, Lumpen, and have worked for Newcity, so how has being in publications around the city influenced your work? Poretus: Trubble club was a great. I lucked out encountering them early on. I started publishing in a bi-monthly publication that ran for two years called Landline. I picked up the first issue while I was a Pilsen kid in the scene and noticed every artist and musician I knew was in it. The first issue had an open call so I submitted some work, and they rejected it. I added in my submission if they needed any editorial illustration work for articles I would like that opportunity. They gave me an article to illustrate and it was published in the second issue. Grant Reynolds was included in the issue. He was a great voice for getting me involved with Trubble Club. Also, my good friend Ben Marcus vouched for me and opened the door for me to get involved, not like its the mafia or anything, since you must be invited to join. I got to meet Joe Tallerico who edits the Lumpen comic section, and does a fantastic job, and that’s how I became apart of that. Aaron Renier put me in his Infinite Corpse project within meeting him twice. These are incredibly generous people with these types of opportunities. The first pager I did for Joe was the first comic I had published anywhere. It was a big deal for me. It felt good to see my work in print. The backend path of cartooning has always been the struggle. Everything that happens with the art when you’re done making it is an uphill battle. I have always been grateful and blown away to see my stuff in print, in a real newspaper, like Lumpen. Getting over the fear of putting something [in the public eye] that felt unfinished or less than what I thought it should be was paramount to moving on with my life and career. I’m thankful for everyone who has published me at this point. I have read that no matter how big you are, it’s nice if people can look at the progression of your work. Howell: Let’s talk more about community. Spudnik is a big co-op where people come to create and there are tons of cartoonist that are actively involve. Do you feel a specific draw to working within these essentially collaborative environments? 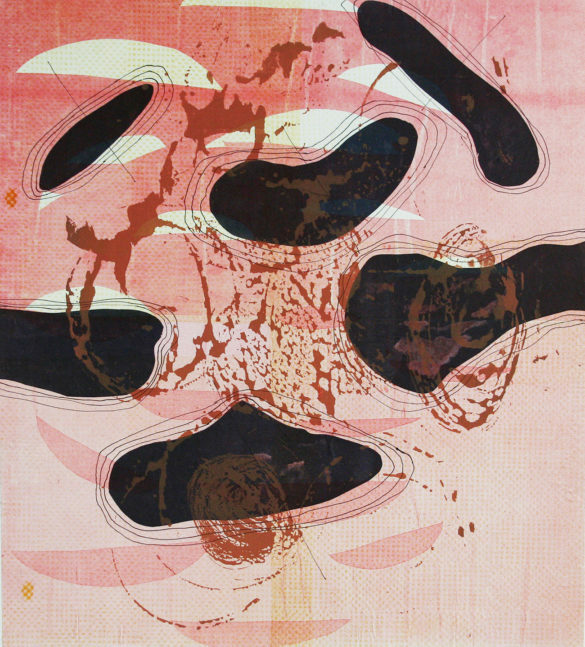 Howell: Who are some printmakers who you are reading and looking at currently? Porteus: Her work is always operating on many levels. 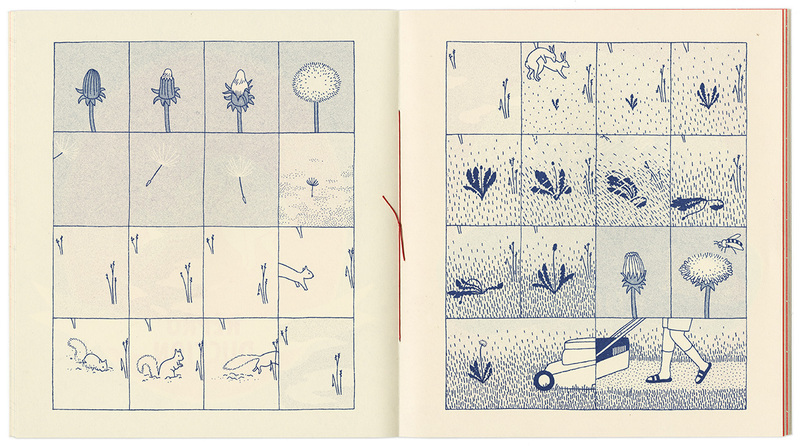 Andy Burkholder remains a guy who I’m always impressed with, especially in terms of messing with vocabulary. That dissonance is what I’m very attracted to. The Zine Not Dead guys, Bred Press and Perfectly Acceptable. They are picking up the Brain Frame torch. You need to bring people together. It’s very important. Howell: I feel like there is this missing step between people who make a living from comics and us. There is a dissonance I have been struggling with upon entering this world of comics. Everyone is very loving and open to give feedback, as long as said feedback is never negative towards the artist. Why is everything seemingly so unspoken? 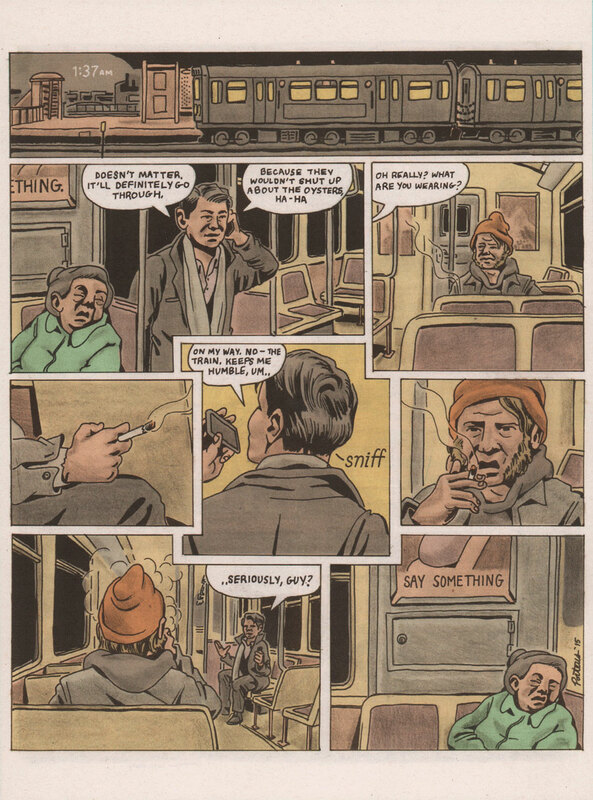 Porteus: Both Chris Ware and Art Spiegelman are quick to say, “Oh I never expected to make a living off comics and I don’t recommend it” as they recoup many befits from having done what they say is completely impossible. Part of the nepotism within the upper crust of alternative comics is caused by the tiny patch of land that a lot people are fighting over. People are very nice while also extremely competitive. I remember fondly the second time I met Anya Davidson. She told me “I checked out your stuff,” and that was it. There was a conspicuous missing second part to that sentence, and that says she’s really good! I thought that was really cool. She’s not putting her opinion out there she will later regret. Now I’m hungry to impress Anya Davidson. Howell: What is advice you would give to people just beginning to self-publish? Porteus: Don’t be afraid to really put work out there, but always be honest with yourself about what you’re putting into it. It will always take more than it gives back, but most artists I know wear this as a point of pride. I’m all about self-righteousness. Work really hard! [laughs] Have that be enough. It won’t matter what happens externally because you will be proud of the work you have done. In my mind that is my fail-safe. At the same time, never be afraid to show people. I think the only way to improving visibly is by doing. 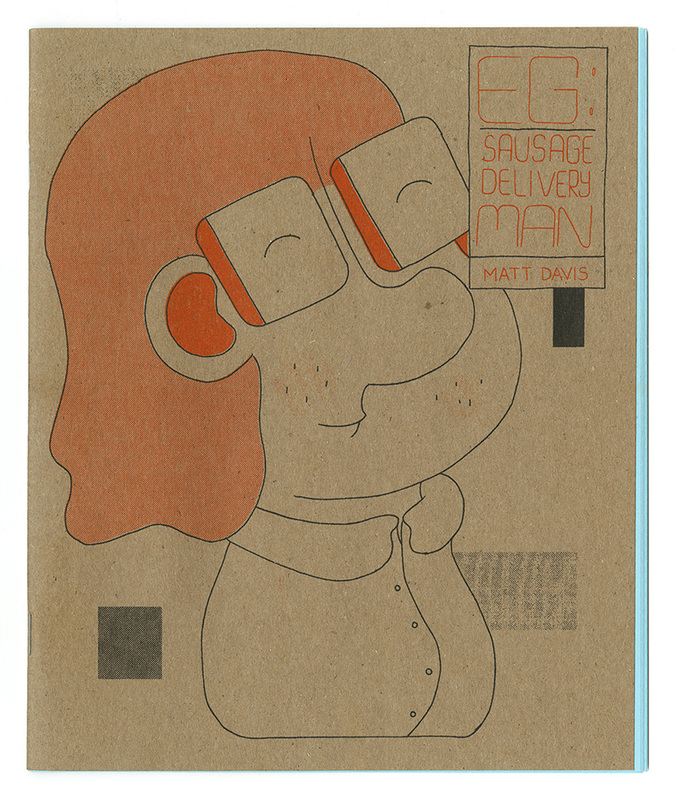 You can find George printing at Spudnik and selling work at Quimby’s, CAKE, and other various zine fest and comic events around the city. Posted August 31, 2016 by Studio Assistant & filed under Member Interviews, News. Kevin Brouillette is a recent Columbia graduate and native Chicagoan who flies by the seat of his bicycle. He’s an entrepreneurial graphic designer who focuses on print and web design. Spudnik Press Cooperative (SPC): Tell us a little bit about yourself and what you do. In general, what I do is a mix of print and web media. I’ve been trying to focus a lot on print lately­–which has been really good. What I do most of my days is work on designing service industry/restaurant materials that will help promote the café environment, from menus and signage to things that are graphic for the inside of a café. (SPC): What do you do when you’re not working or designing? I try to volunteer with charities if I can. I helped out with Food & Water Watch for a while. I like coffee culture and going out for cocktails. I bike a lot. I bike almost everywhere I go and just carry all my stuff with me. I kind of have a mobile workflow so I’m always on the move. (SPC): How do you feel that being on the go constantly has affected your design practice? I’ll have a day where I feel like I’ve done something very substantial. That is what drives me and motivates me to do more. Each day I like to get something solid done. Being on the go gives me the flexibility to jump from place to place whenever I feel like–which is really nice. It’s stimulating and helps me keep my mind and environment fresh. 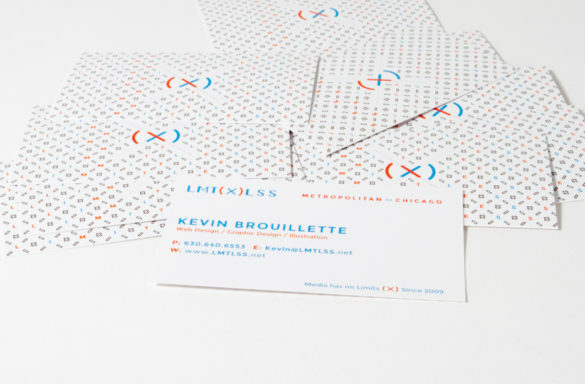 (SPC): Tell me a little about Limitless (LMTLSS) Branding. That was my original thing I started back in 2009. I worked with my friend Eric Youngberg to collaborate. Limitless was a brand name for us. I did the whole design concept for it and Eric did all of the back end coding and development aspects. We made a handful of websites together. 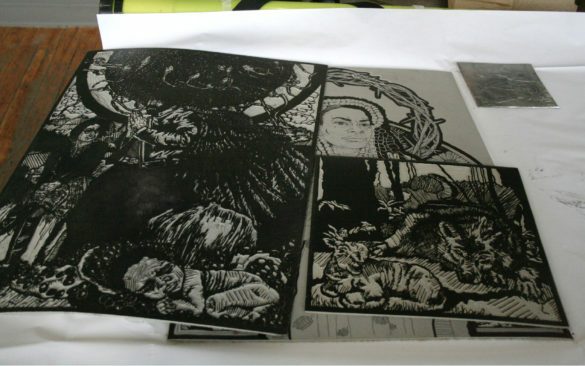 Another aspect of Limitless is that we used to screen print t-shirts with my friend Clare Byrne who does illustration. Right now Eric and I are working on a brand new site for Dollop- but we don’t call that Limitless since I work for Dollop Coffee now. (SPC): How do you approach print design vs. web design? I think the approach is similar. With print I do a little more work with creating concept boards. With web I find a few ideas or concepts generally that I like in different websites that I see online and then start taking those ideas and apply them to what I’m working on. I usually start with a clearer end goal for web as opposed to a print project. I’m very pre-meditated due to the level of collaboration. A lot of time when I’m given a project I try to do some research to find some things to make references to. For a recent project, I started out researching old bakeries around Chicago with archival photos to use as reference points as how a bakery in Chicago looks- then and now. I look online a lot for influences. Particularly how other people are using type. Typography is something that I focus on a lot­–collecting and finding typefaces that I like. (SPC): What’s your favorite thing about Chicago? Chicago has a really strong design community. I try to go to different events because I really thrive off of inspiration from other artists. Everyone is very supportive of each other, which is something that I really appreciate. It’s a collaborative effort when you really get down to it. 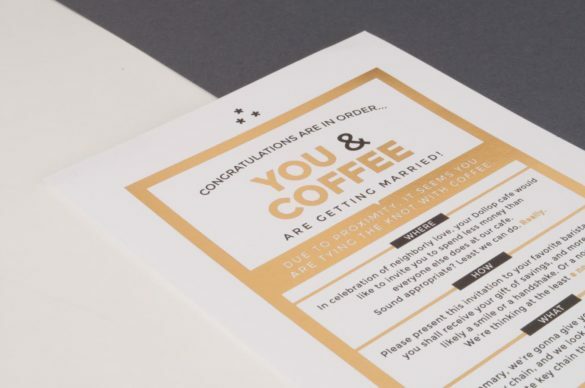 (SPC): How did you get into designing for coffee brands? Do you think you’d be in a similar line of work if you lived elsewhere? I don’t think so. It’s a very fun story how I got into working on coffee brands specifically. My whole time in Chicago has been cohesive with all of this. Back when I was 16 I started working in a café out in the burbs where I grew up. They serve Metropolis Coffee there. I developed a very strong brand loyalty to the Metropolis brand because I liked their design work and I liked their coffee. I worked for them for about 3 years and then started going to Columbia so I moved to the city to be closer to school. During that time I was looking for a new job but knew I wanted to work somewhere with Metropolis coffee. 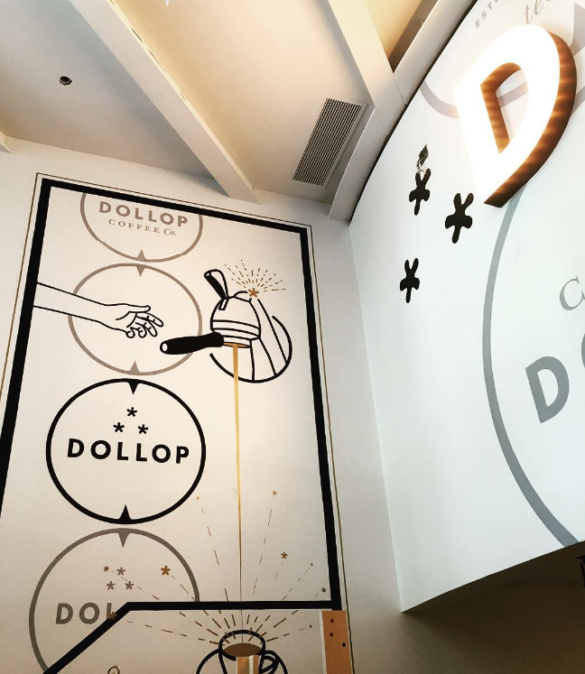 I had visited Dollop in Streeterville, which is our main location. While I was there I just happened to meet this guy named Dan Weiss, who is the owner of Dollop Coffee. About 6 months later I sent him an email and we got in touch to start working there. Everything worked out exactly how I wanted it. I did café work with Dan for about 2 years at Dollop. Dan slowly started shooting ideas my way since he knew I was interested in design. We started collaborating from there and started doing more and more. 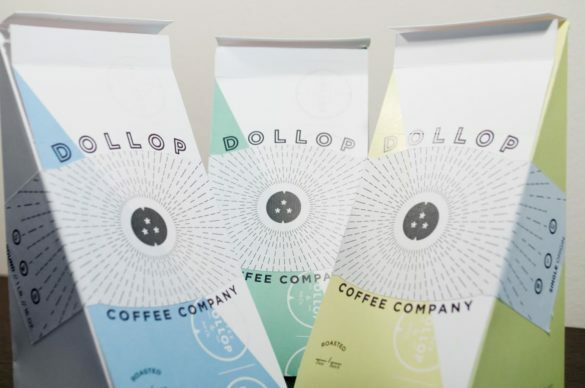 Firebelly Designs is a really great design firm that created the initial branding for Dollop back in 2012. I really look up to them. So now I fill in the gap and make things that stem from what that they created as the Dollop brand has become more established. (SPC): Since you are rooted in the web world and branding, how do you feel about social media as a marketing tool for designers and printmakers? I’m more inclined to follow a designer on social media that posts more about their day-to-day life and things they’re doing as well. Things that they interact with day-to-day influence their work in some way or another. I think design relies so heavily on culture, so for a designer to only post their designs seems less authentic. (SPC): What are some recent, upcoming or current projects you are working on? Most of the past four months has been spent designing identities for new Dollop cafes as they expand. We try to design them around the neighborhood so that they shift with the audience. Right now my big thing is working on the new location for Dollop in Hyde Park. It’s on the University of Chicago’s campus. It is very graphic and interior design oriented. This project has been weeks in the making but we are now finally scoping out the space to decide what we want to do with it. Everything I design for the shop has to play off of contractor/ designer, Paul Leissen, as he builds and designs all the furniture and interiors. 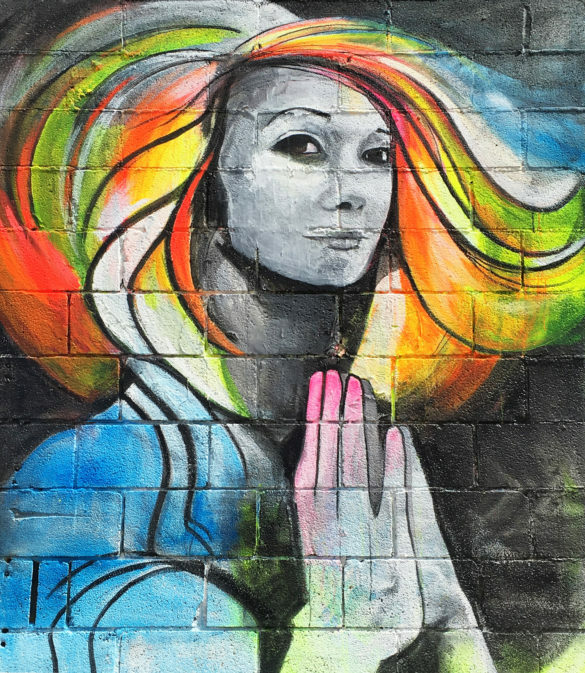 Basically I collaborate with him and take some of the colors and things that he’s doing and we work together to make it a well-rounded project. For example, we are doing a really cool wall installation that is going to be typography and illustration mixed together that will span across many walls. We are also building a potentially screen printed wall menu structure, as well as whole walls with graphics that were once on my computer screen. It’s pretty cool to see that blossom. There are a few things that I’m working on for Metropolis that will be popping up across the U.S. in Metropolis carrying cafes. The Dollop café on Monroe is a great shop to see stuff we’ve been working on. I helped create the marquee sign and all of the wall graphics there, as well as menus. To see more of Kevin Brouillette’s work, follow him on instagram at @kevinbrou, or visit his website www.kevinbrouillette.com!